STRONGSVILLE, Oh. 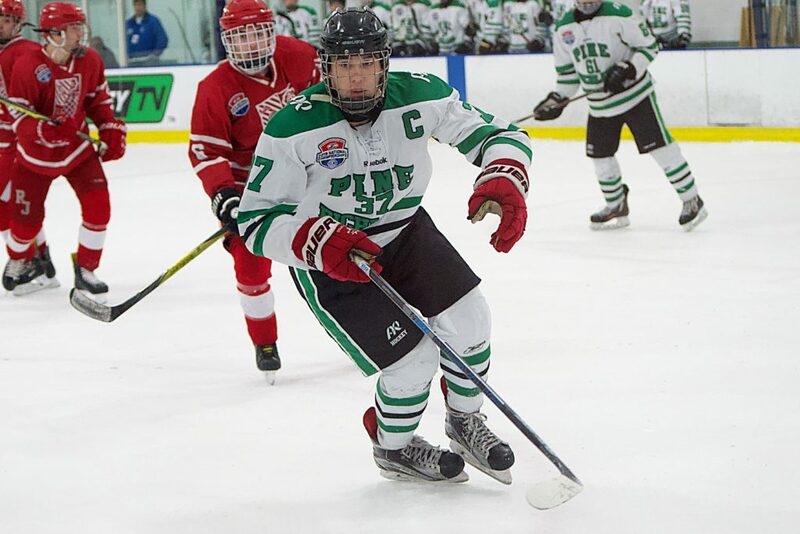 — The Pine-Richland Rams closed out their season on Sunday at OBM Arena in Strongsville with a 4-1 defeat at the hands of the Regis Jesuit in the quarterfinals of the USA Hockey National Championships. Jordan Rosenbaum’s late goal was the only offense that the Rams could muster, and on every rush the team from Aurora, Colorado stifled and confused the 2019 Class-AA Pennsylvania Cup champions. For Pine-Richland, it was the first regulation loss on the year. The only other blemish on the Rams season came in a shootout loss at the hands of the Hampton Talbots in February. The team overcame an offensive surge from Upper St. Clair in a wild Penguins Cup final, but other than a seven-round shootout victory over Greater Latrobe, Pine-Richland always found a way to win. They also continued to have a plan, as well as larger goals. For the second-highest scoring team in the classification, they received the fourth-lowest number of power-play opportunities. Teams weren’t taking bad penalties against them, as Pine-Richland didn’t rile up opposing squads, they just went in, did their business, and went home. They were in the middle of the pack on the penalty kill, but only gave up eight power-play goals on the regular season. The other element of the team was that the varsity squad featured 14 seniors that were able to lead by example for the younger team. The squad started the season as the 2018 St. Margaret Faceoff champions, and proceeded lead the way, helping to grow the game for the next wave. The game signified the end of the high school careers of the senior class, and there was no question of what drove the team to the national tournament: family.